to book for more then 1 people just additionally press the “Add” button (depending on the number of people, meaning: 4 additional people – 4 times press add ). You can check your reservation details on the right side. 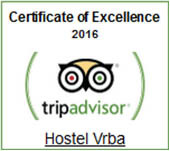 Enter promo code “vrba” and get 5% discount at check-in. Tourist tax (1,27 € per person per day). Reception: every day from 8 AM to 8 PM. Check in time is from 2 PM till 8 PM (later arrivals should be announced in advance). Check out time is 8 AM till 10 AM. pre-authorise your card before arrival. amount of the reservation in case of a no show or later cancellations). We can organize for you a shuttle transfer from airport, just send us email in advance. 72 h before arrival cancellation is for free. We will charge the whole amount of the reservation in case of a no show or later cancellations.